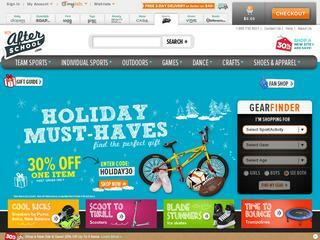 AfterSchool.com is a completely new way to shop for kids' favorite sports and activities. Whether they are into sports, outdoor recreation, dance or art, AfterSchool.com has the gear kids need. With over 35,000 products in one place, plus helpful tools like Age Filters, Gear Checklists and Gear Guides, you'll spend less time shopping, and more time cheering your kids on. And with free 2-day delivery on orders $49+ and free 365-day returns, getting kids ready to play has never been easier. Know any afterschool.com coupon code/deal not listed here? Please post it & share!